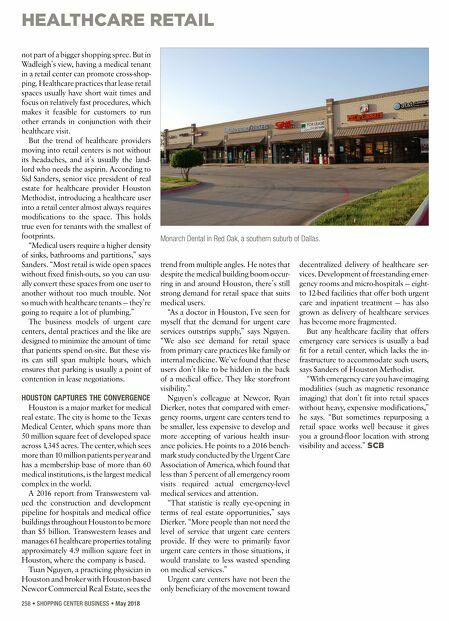 HEALTHCARE RETAIL 258 • SHOPPING CENTER BUSINESS • May 2018 not part of a bigger shopping spree. But in Wadleigh's view, having a medical tenant in a retail center can promote cross-shop- ping. Healthcare practices that lease retail spaces usually have short wait times and focus on relatively fast procedures, which makes it feasible for customers to run other errands in conjunction with their healthcare visit. But the trend of healthcare providers moving into retail centers is not without its headaches, and it's usually the land- lord who needs the aspirin. According to Sid Sanders, senior vice president of real estate for healthcare provider Houston Methodist, introducing a healthcare user into a retail center almost always requires modifications to the space. This holds true even for tenants with the smallest of footprints. "Medical users require a higher density of sinks, bathrooms and partitions," says Sanders. 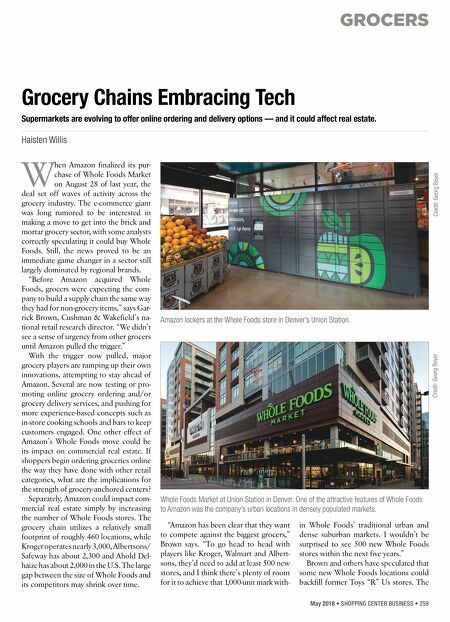 "Most retail is wide open spaces without fixed finish-outs, so you can usu- ally convert these spaces from one user to another without too much trouble. Not so much with healthcare tenants — they're going to require a lot of plumbing." The business models of urgent care centers, dental practices and the like are designed to minimize the amount of time that patients spend on-site. But these vis- its can still span multiple hours, which ensures that parking is usually a point of contention in lease negotiations. HOUSTON CAPTURES THE CONVERGENCE Houston is a major market for medical real estate. The city is home to the Texas Medical Center, which spans more than 50 million square feet of developed space across 1,345 acres. The center, which sees more than 10 million patients per year and has a membership base of more than 60 medical institutions, is the largest medical complex in the world. A 2016 report from Transwestern val- ued the construction and development pipeline for hospitals and medical office buildings throughout Houston to be more than $5 billion. Transwestern leases and manages 61 healthcare properties totaling approximately 4.9 million square feet in Houston, where the company is based. Tuan Nguyen, a practicing physician in Houston and broker with Houston-based Newcor Commercial Real Estate, sees the trend from multiple angles. He notes that despite the medical building boom occur- ring in and around Houston, there's still strong demand for retail space that suits medical users. "As a doctor in Houston, I've seen for myself that the demand for urgent care services outstrips supply," says Nguyen. "We also see demand for retail space from primary care practices like family or internal medicine. We've found that these users don't like to be hidden in the back of a medical office. They like storefront visibility." Nguyen's colleague at Newcor, Ryan Dierker, notes that compared with emer- gency rooms, urgent care centers tend to be smaller, less expensive to develop and more accepting of various health insur- ance policies. He points to a 2016 bench- mark study conducted by the Urgent Care Association of America, which found that less than 5 percent of all emergency room visits required actual emergency-level medical services and attention. "That statistic is really eye-opening in terms of real estate opportunities," says Dierker. "More people than not need the level of service that urgent care centers provide. If they were to primarily favor urgent care centers in those situations, it would translate to less wasted spending on medical services." Urgent care centers have not been the only beneficiary of the movement toward decentralized delivery of healthcare ser- vices. Development of freestanding emer- gency rooms and micro-hospitals — eight- to 12-bed facilities that offer both urgent care and inpatient treatment — has also grown as delivery of healthcare services has become more fragmented. But any healthcare facility that offers emergency care services is usually a bad fit for a retail center, which lacks the in- frastructure to accommodate such users, says Sanders of Houston Methodist. "With emergency care you have imaging modalities (such as magnetic resonance imaging) that don't fit into retail spaces without heavy, expensive modifications," he says. "But sometimes repurposing a retail space works well because it gives you a ground-floor location with strong visibility and access." SCB Monarch Dental in Red Oak, a southern suburb of Dallas.